This recipe was supposed to be called Pecan Sticky Buns. I love pecans and buns but am not a fan of sticky. 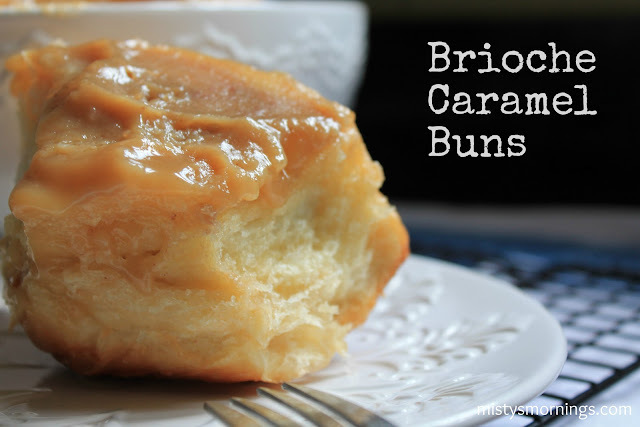 So, I altered the recipe a bit here and there to wind up with an amazing combination of homemade brioche dough with the soft caramel topping from my mother-in-law's famous caramel roll recipe (the entire recipe can be found at the bottom of this post). There was an awful lot of butter (some of which I left out and found it to be no problem) in the recipe and so many steps that from start to bake I think almost five days went by. The good news is that the dough didn't suffer one bit from waiting for me in the refrigerator all that time. 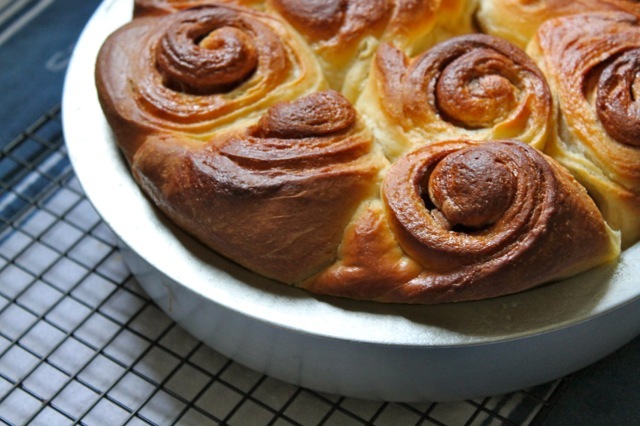 Plus, any dough that can be made in the mixer instantly becomes a favorite of mine. I used my own ratio of cinnamon sugar inside the rolls which was 1/4 cup white sugar and 2 teaspoons of cinnamon for each set of rolls. The recipe called for much less cinnamon but I prefer a stronger taste and it turned out perfectly. Instead of using nuts and the sticky caramel topping called for, I substituted 1 1/2 cups heavy cream and 1 1/2 cups brown sugar. Warm the mixture in the microwave and stir to combine. Pour over the rolls before they rise. This is the crucial step! Out of the oven the tops are golden brown and the caramel may seem a bit runny. Just leave them out to cool for several hours before turning them out. I absolutely loved these rolls and would make them again in a heartbeat. 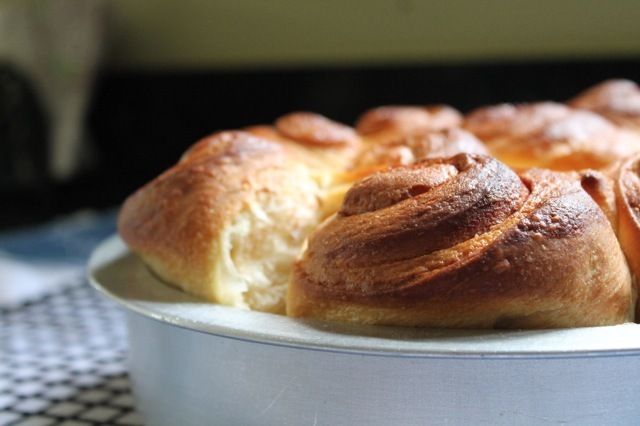 If you want to make the same roll without going through the process of making the dough by hand just substitute Rhodes rolls as you will see in my recipe below. Find the original Pecan Sticky Bun recipe from Baking With Julia here and here. 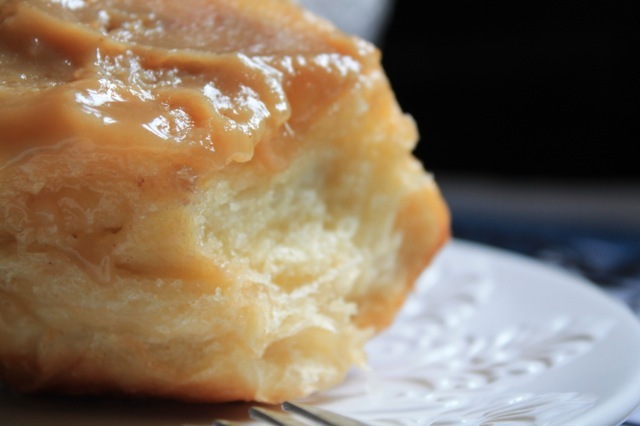 Caramel rolls are not sticky buns, nor are they meant to be chewy. Caramel rolls are like cinnamon rolls with soft, creamy caramel topping instead of icing. 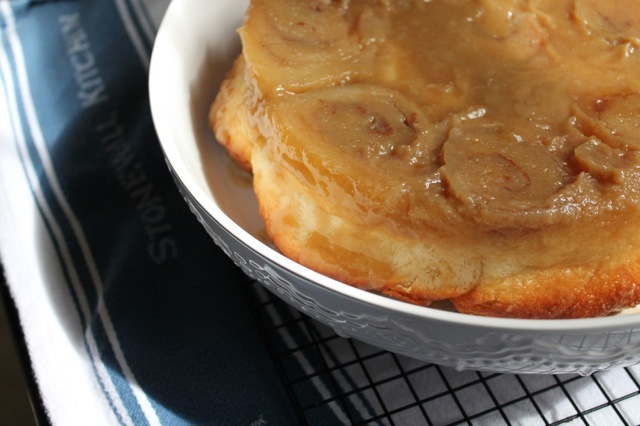 I was blessed to have married a man whose mother is famous for her caramel rolls. 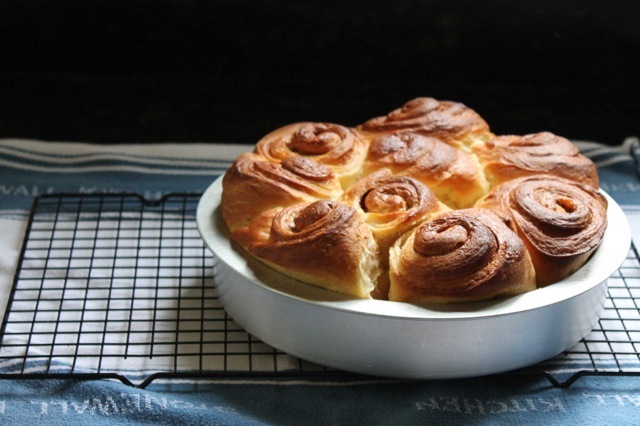 Never a holiday has passed when tray after tray of these rolls aren't pulled from the freezer, having been made in advance, to grace our breakfast plates. It is hard to pass by the tray all afternoon without secretly swiping a fingertip through the caramel to taste it again. 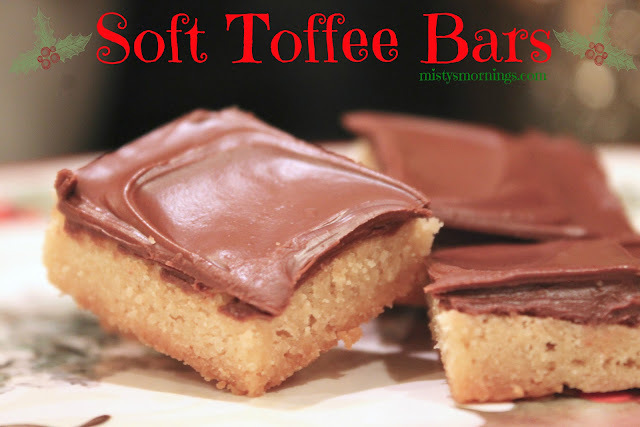 Best of all this recipe could not be easier! 1. Coat three 9x13 pans with cooking spray. 2. Divide rolls evenly among pans. Allow to raise 2 1/2 hours. 3. In a large microwave safe bowl mix sugar and cream and microwave for 2-3 minutes. 4. Stir in vanilla and a dash of salt. Mix until sugar and cream are well combined. 5. 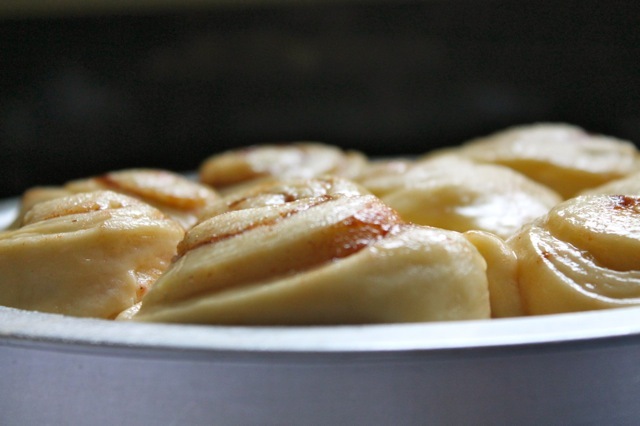 Pour approximately two cups of sauce over each pan of rolls. 6. Cover pans with cling wrap and allow to raise another 2 1/2 hours. 7. Preheat oven to 350 and bake rolls, uncovered, for about 30 minutes. 8. Rolls will be browned and sauce will be slightly runny. 9. When completely cooled, turn out onto large sheet of foil. Microwave individual rolls about 15 seconds before serving. I too was surprised at how little cinnamon was in the recipe. Caramel sound delicious. 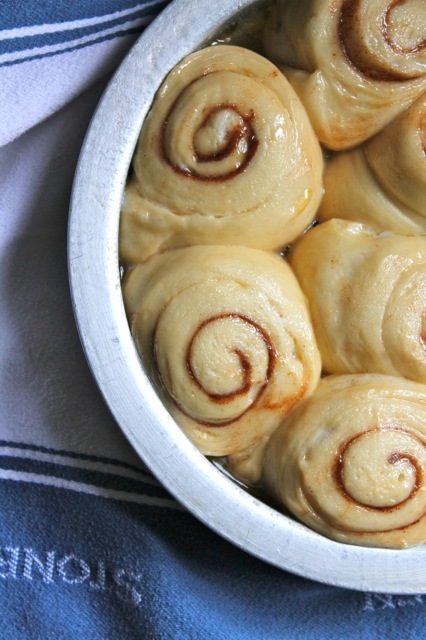 Your caramel cinnamon rolls look delicious! I can't believe you made it with caramel!!! Crazy!!! Looks delicious!! I used a strong cinnamon, so I thought it was okay; but if I were using my everday cinnamon, I can definitely see where more woudl be needed. And caramel. Yum. Yum. Yum. The variation is such a good one! 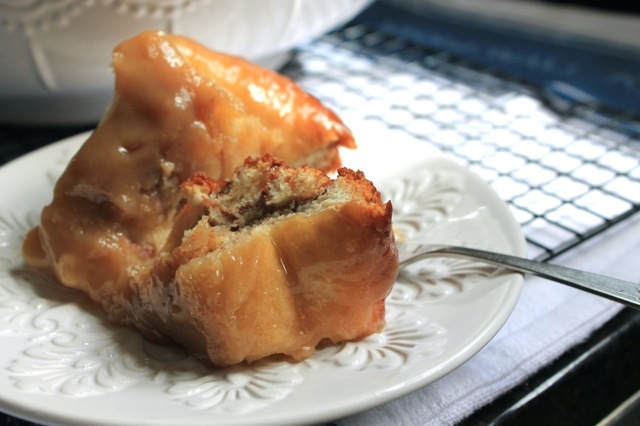 The sticky sometimes is too much, but caramel-only is a winner with me everytime!